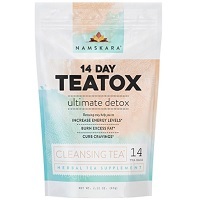 I give Namskara 14 Day Teatox 4 out of 5 stars, so I really like it. It tastes good, it’s easy to use, and I felt great while using it. The taste is a light Green Tea flavor with a hint of sweetness. I think most people out there will like the taste, as long as they like tea! I also like how easy it is to use. You only need to consume one cup of tea per day, in the morning before breakfast. All in all, you need to use it for 2 weeks. I had a lot of energy and noticed less bloating while I was on this teatox. I can’t attribute all this to the tea however, as I ate healthy and worked out often. But I definitely think the tea played a part in how great I felt! What I don’t like about Namskara teatox is how they don’t have a guarantee and how expensive it is. But overall, I think this is a very good detox tea. This tea couldn’t be any easier to use. All you need to do is drink one glass of tea in the morning before breakfast. Sometimes I’m really hungry in the morning, so I’m impatient waiting to eat, but I just ended up drinking the tea while I made breakfast. Namskara 14 Day Teatox comes in teabags, and you just need to steep them in almost boiling water for 5-7 minutes. Easy enough! I really enjoy the taste of this detox tea, however it’s not my absolute favorite. I think most people will like the taste of this tea. It tastes like a mix of Green Tea and Rooibos, with a hint of sweetness. The sweetness obviously comes from the Stevia they include in here. I looked forward to my morning cup each day. It has a tiny bit of a bitter after taste, but it didn’t really bother me. Namskara has a great ingredient lineup. My favorite part about it is that it doesn’t contain any laxatives! This teatox contains 3 different kids of tea, all of which have been said to promote healthy weight loss. It contains Rooibos, Green Tea, and Oolong. 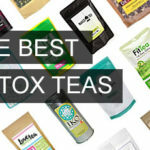 I love all of these teas for their different health benefits. It also contains ginger root, which is known to have a calming and anti-nausea effect on your stomach. Another ingredient in Namskara 14 Day Teatox is Garcinia Cambogia. This is an ingredient used in a lot of weight loss supplements. It’s said to help you curb cravings and stay fuller, longer. I have to say, I felt pretty good while using this detox tea. Now, it’s no miracle tea, none of them are. But I used it in conjunction with a workout plan and healthy diet, and I noticed some positive changes. I was surprised how good I felt with only drinking one cup of tea per day. Now, I didn’t notice any change in my hunger, and I wouldn’t say my cravings were curbed. That’s just wishful thinking. But overall, I liked the way I looked and felt while using this teatox. I felt a little bit of heartburn a few times after drinking this tea. But that could be because you need to drink it on an empty stomach. It went away once I ate. 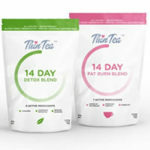 Namskara 14 Day Teatox is $29.99 for a 14 day supply. That’s $2.14 per day, which is pretty expensive compared to most detox teas. I’ve noticed they often have sales on their website where you can get the tea for half price which is nice! No, I couldn’t find a guarantee via their website. They state you can return the product, but it can’t be overly used. What does “overly used” mean? Does that mean I can’t try it for a week and then send it back? That’s not much of a guarantee in my eyes. 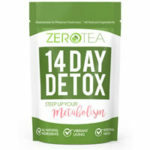 To buy Namskara 14 Day Teatox, Click Here. Ease of Use Very easy to use, drink one cup each morning before breakfast. Taste Tastes good, like Green Tea with a hint of sweetness. Results I looked and felt great while using this tea. Side Effects I had a little heartburn. Price/Value It’s $2.14 per day, which is very pricey.